Animal cruelty is widespread in the Queensland greyhound racing industry, says an Australian government report. Its author, Alan MacSporran, QC, said the industry had failed systematically to assess and manage how animals were treated by trainers and racers. The report follows the release of footage earlier this year of trainers using live animals to bait racing dogs. Mr MacSporran said the fact trainers had not hidden the "barbaric" treatment of animals "tells its own story". In April, 55 greyhound carcasses were found dumped in a wildflower reserve on the coast of Queensland . Police and animal authorities investigated the find as part of a joint taskforce established by the state government following an expose by the Australian Broadcasting Corporation (ABC) in February into the practice of "live baiting" within the greyhound racing industry across the nation. The ABC had aired disturbing footage of greyhounds chasing live pigs, possums and rabbits around tracks. The "bait" animals were tied to mechanical lures before being chased and mauled to death by dogs, in what Mr MacSporran's report said was an "archaic and barbaric practice". Four Australian states - NSW, Victoria, Queensland and Tasmania - launched inquiries into greyhound racing. Dozens of trainers have already been suspended across the country, some have been banned from ever participating in greyhound racing again and others have been charged under animal cruelty laws. Announcing the completion of the report, Queensland Premier Annastacia Palaszczuk said those responsible for the cruelty "will be brought to justice". She said the discovery of the mass graves was "deeply disturbing" and described live baiting as "absolutely disgusting". "There will be swift and decisive action in regards to this report," she said at a press conference on Monday. 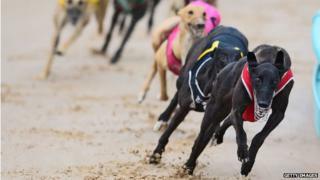 To be tabled in the Queensland parliament on Monday, the report will describe how small animals such as kittens, rabbits, piglets and possums were used to "blood" greyhounds, while dogs that lost too many races were cruelly treated and killed. Some had their ears cut; others were bludgeoned to death, according to some submissions to the inquiry. Mr MacSporran said people who were already before the courts on animal cruelty charges were not included in the report. "Although there is no definitive evidence it is widespread... it would be naive in the extreme to think it was not widespread," he said of such behaviour.